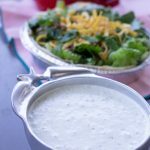 Cafe Rio Style Creamy Tomatillo Salad Dressing is an essential component to any Cafe Rio style meal! 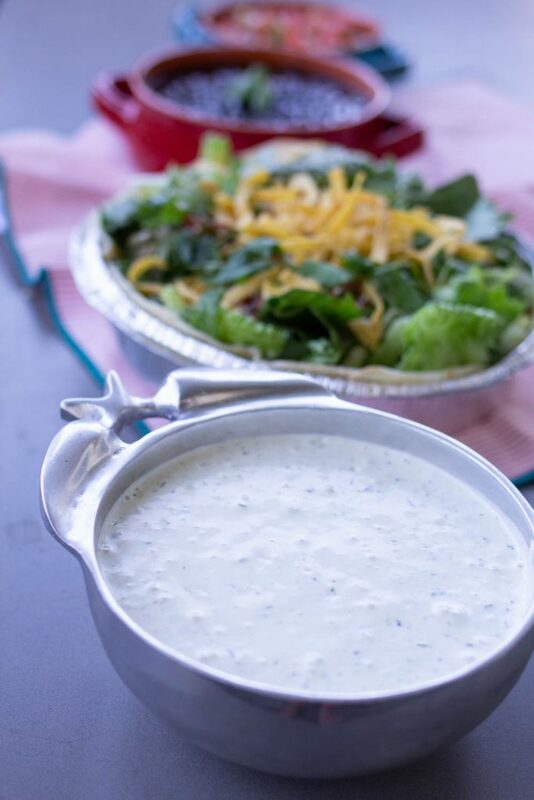 What’s a Cafe Rio salad without the dressing? While other copycat recipes use dried or bottled Ranch dressing, this recipe is all home made. 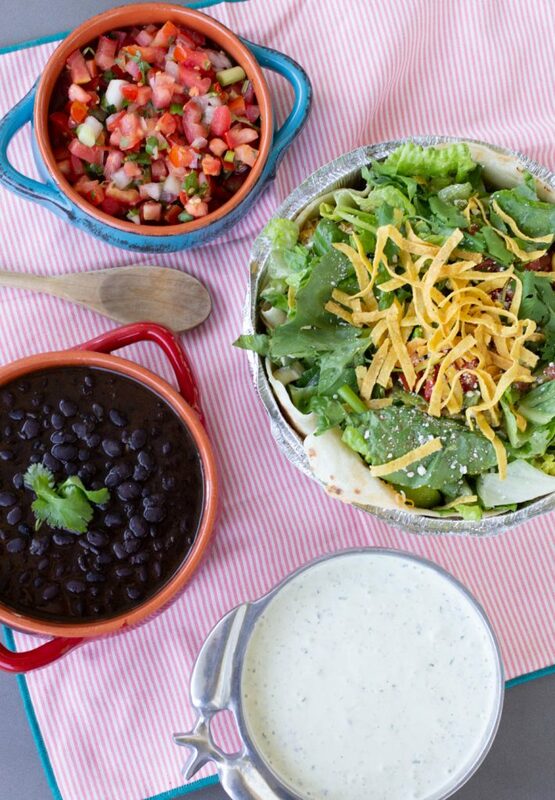 Cafe Rio Style Creamy Tomatillo Salad Dressing is creamy, tangy and a little bit spicy. Made with fresh tomatillos, and a fresh jalapeño, the amount of heat will depend on the amount of seeds you leave in the dressing. If spicy dressing is not to your liking, make sure to remove most of the seeds from the jalapeño before adding to the dressing. Also, it is good to know that any spice added to the dressing is likely to increase in intensity the longer it sits! I always use food handlers gloves when cutting up jalapeños they leave juices and oils on hands long after washing, and can cause a lot of irritation to your eyes when touched even hours after cutting up. If you don’t have food handler’s gloves, you can use a plastic grocery sack on each hand! Tomatillos are found in the refrigerated section of the produce department. They look like small green tomatoes when peeled and are covered in a paper like skin. When purchasing fresh tomatillos, look for fruit that is firm to the touch, the squishy tomatillos are most likely overripe or damaged! Make sure to thoroughly wash the tomatillo after peeling as stated in the recipe as they usually have a bit of dirt and oily film on the skin. I like to use a blender or an immersion blender when making Cafe Rio Style Creamy Tomatillo Salad Dressing. Throw all of the ingredients in a large jar or the blender and whirl until smooth. So simple and fresh. 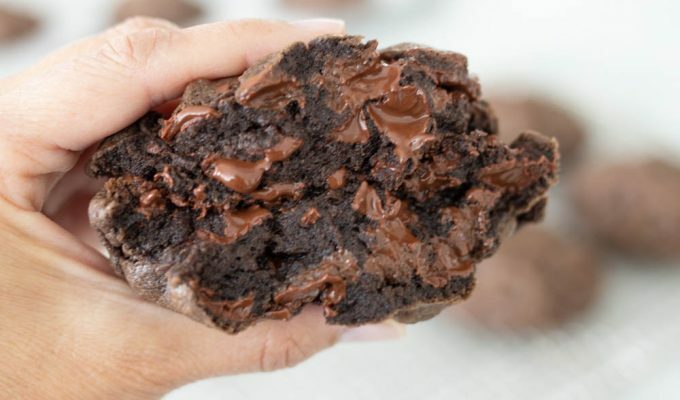 If your family loves dressing, you may want to make a double batch! Place all ingredients in a blender or use a hand immersion blender and blend until smooth. Yum! I've tried many different recipes for this dressing and they all tasted too much like ranch so I am excited to try this! Eden, I think you will love this! Um. Blonde question. When you say jalapeno, seeded, does that mean de-seeded? Or to leave the seeds … I'm assuming I need to get rid of them or this will be SPICY! I used to live in Las Vegas and there was a Cafe Rio down the street.. this is my most favorite dressing, I put it on everything! This dressing is spot on! Thank you so much, we love it! Do you know if it can be frozen for later use? Thank you! I have not ever frozen the dressing? Im guessing it will not freeze well but if you give it a try, please come back and leave a comment and let us know! You ROCK! Searched high and low for this dressing that is truly homemade and it was SO disappointing to see how many people have to rely on a packet of MSG-ridden dust from Hidden Valley to make a dressing! 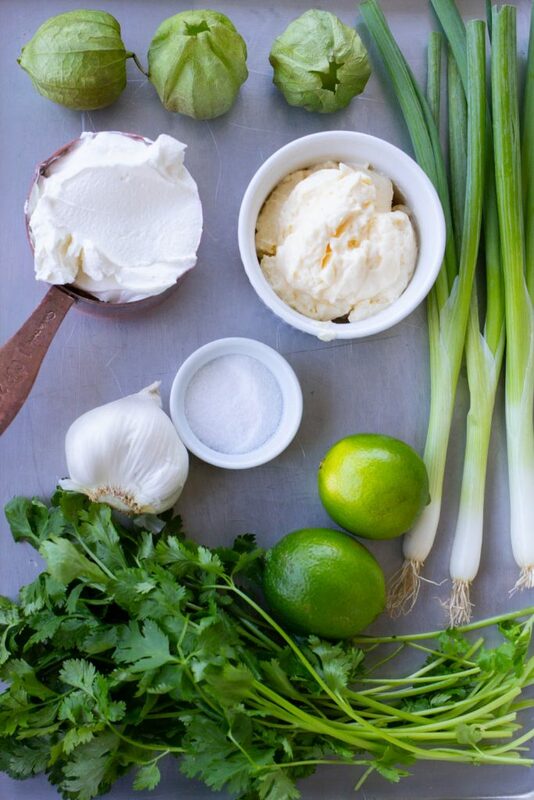 I know you’ll love this dressing. It’s delicious! This recipe is spot on. I had my friends try it, and they liked it better than Cafe Rio’s!